It was a peaceful night — despite the occasional blast of sand. Intermittent gusts of wind — strong at times — swept through the mesh of my one-man tent. I slept on the ground next to my truck — parked just one mile from the dunes. My alarm sounded well before sunrise. I put on my headlamp, and laced up my boots. Though space is limited in my tent, I always find room for my boots. There are many nocturnal critters in the desert with sharp, pointy, and poisonous appendages. I gathered my gear, and set out for the dunes. I was in a bit of a strange mood that morning. I was excited to see the dunes at first light, but my energy was lacking. My back was sore, and my legs were clumsy as I made my way across the dark desert. I can understand the part about the sore back — I slept on the ground last night and spent much of yesterday hiking through the dunes with a heavy pack — but this was only the morning of Day 2. Thinking back to last year, I remembered having the same feeling. I knew I would shake it off in the coming days, I just needed to get back in the swing of things. 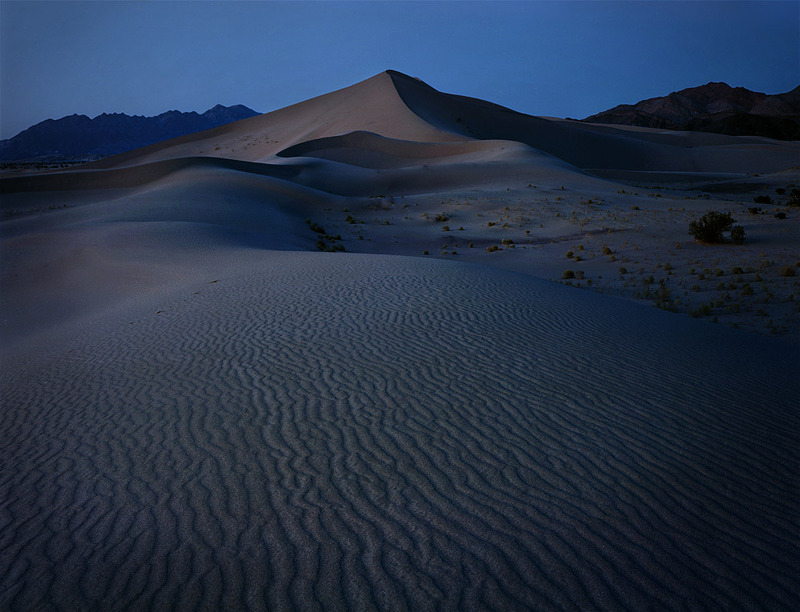 I reached the dunes under moonlight, and dropped my pack on a low dune. I sat beside it, and took in my surroundings. It was an hour before sunrise, and still too dark to scout for morning light. I put on my jacket, and laid in the sand. Set against an intrepid display of shimmering stars, several satellites crossed the night sky. This is what landscape photography is all about — getting out in nature, and feeling a connection with the land. In this case, the connection was quite literal. I left my bag behind, and climbed a nearby dune. There was now a glimmer of light to the east. The dark blue night sky gave way to bit of orange, low on the horizon. I took a moment to find my bearings. The dune I stood atop was a serpent of sand, radiating from a massive triangular dune to my east. This pyramid of sand was set against two mountains, giving the scene an enormous sense of depth. I knew immediately that this was the dune I had been searching for. Through dumb luck, I stumbled upon this scene with my clumsy legs. In the many hours spent wandering the dunes yesterday, I failed to see this composition. This is my frustration with the dunes. It’s easy to walk past an ideal composition if the light isn’t right. Thankfully, I hadn’t marred the sand with footprints last night. The dune at my feet was a soft and round. Delicate ripples led my eye along the sinuous arm of sand to the very peak of the sharp, angular, and graphic dune that dominated the landscape. I slowly crept forward, looking for the right balance of elements. I watched as the light continued to develop. The low glow in the east soon washed away the stars, leaving the moon alone amidst a deep blue sky. The earth’s shadow dropped to the west, and direct light appeared on the distant mountains. Soon, the sand at my feet was bathed in a brilliant display of orange light. Though this light was beautiful, I preferred the soft blue light roughly 20 minutes before sunrise. I formulated a plan to return with my camera later this afternoon, and set up for a morning shot. This would involve leaving my camera out overnight. There was one problem with this plan — the wind. Perhaps I failed to mention the severity of it. What began as a low, persistent wind at sunrise, developed into 40 to 50 mile per hour gusts. I was forced to close my eyes, and endure the onslaught of wind whipped sand while cresting several dunes. Despite the forced facial exfoliation, it was an invigorating experience. I witnessed first hand the force that shapes and sculpts the very dunes I was walking on. I returned to camp around noon, made lunch, and read a book to kill time. I checked over my gear, then returned to the dune field around 2PM. It was now very calm — hopefully a sign of things to come. I setup my camera, and used my 300mm normal lens to compose the scene. I selected a horizontal composition, and used rear standard movements to enlarge the background of the composition. I locked everything in place, and stuck around through sunset. Though my plan was to shoot in the morning, I exposed a sheet of Kodak Portra 160 VC when the Earth’s shadow dominated the eastern sky. My camera was destined to spend the night at the dunes. I gathered the rest of my gear and made my way back to camp. It was a good day. This entry was posted on February 27, 2012 at 6:21 pm and is filed under 8x10, Death Valley January 2012, Photo Trips, Photography. You can follow any responses to this entry through the RSS 2.0 feed. You can leave a response, or trackback from your own site. Awesome cinematography and atmospheric soundtrack on the intro! Maybe you should have made 127 Hours…..? Evening photo is great, looking forward to the next one. Excellent … your journey continues. I’m always looking forward to your trip impressions and videos. Thanks for sharing a bit more info on taking the shot and showing the groundglass view – I like that. The evening shot looks fine but now I’m really curious about what you’ve got in the morning. Thanks, Ben for the great job you do on the videos. Wonderful music in the opening. Sounds like something Jimmy Page and Robert Plant might have brought back from Morocco. Matched up perfectly to the location! How incredible was it to be out in the dunes while the winds were working their magic. That must have been an incredible experience. I can’t wait to see the morning shot. The composition is there, now for the light!!! Your video skills are becoming better by the post. This one was really, really enjoyable. Loving the writing too! The afternoon shot looks so amazing, I can’t begin to tell you how much I wish I had the money to buy some of your prints..
Best thing I ever did on the internet was follow your blog, haha. Outstanding image Ben, and great video to document your process. Very nice work! these are really enjoyable videos.